See the changes happening in the Clintonville Community designed to make cycling safer for all! CLINTONVILLE - Neighborhoods like Clintonville are already home to miles of bike paths, but some residents want to expand accessibility to biking from the path to the neighborhood streets. 10TV talked with a few of the people leading the charge who say the effort is to break the stigma that biking can’t be an everyday part of life. “Anyone should feel safe enough to get on a bike without any special clothing or equipment and ride on this network and get to where they need to go,” said Will Koehler, who has lived in Clintonville for nearly 30 years. Koehler brought the idea of a safe biking network to the Clintonville Area Commission (CAC) and the City of Columbus Department of Public Service several years ago. 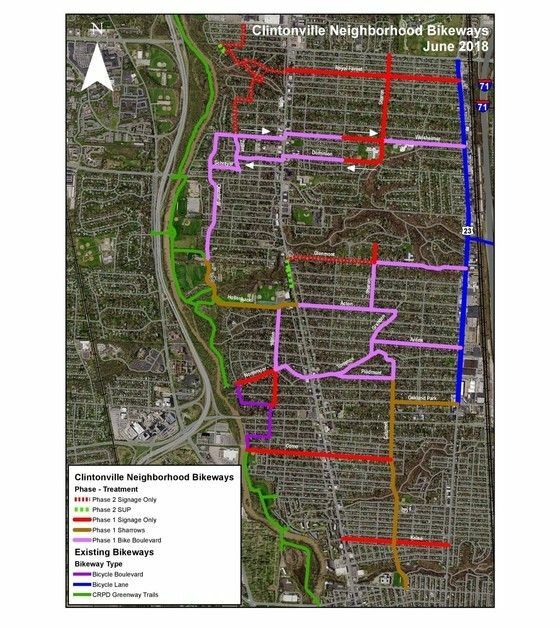 Today, that idea has grown into what is called the Clintonville Neighborhood Bikeways Project. The project consists of a series of low-stress bike routes within the neighborhood, in addition to the bike paths that already exist, designed to encourage people of all ages to ride. “[Everyday] biking improves random encounters between neighbors, it improves patronage of local businesses and it just has so many benefits for the quality of life for everyone in the neighborhood,” Koehler said. While some residents have expressed concern over safety with the addition of the bikeways, Libby Wetherholt, commissioner for Clintonville Area Commission District 3, told 10TV she believes the project is a natural fit for Clintonville and could improve safety in some areas. “Having bikes out there I think will slow drivers down and make them think a little more,” Wetherholt said. Routes included in the bikeways project are based off community input via a CAC planning subcommittee and were reviewed for safety and feasibility by a team of City of Columbus engineers and planners, according to a press release by the City of Columbus. Thanks to approximately $90,000 from the city’s Urban Infrastructure Recovery Fund (UIRF), which pays for neighborhood-oriented projects, new pavement markings and signs are already rolling out around the neighborhood. “The idea is to try to take this network that's already fairly safe and improve the safety to the point where everyone feels comfortable using it,” Koehler said. Koehler isn’t alone. John Robinson, the owner of Johnny Velo Bikes on High Street, told 10TV the Neighborhood Bikeways Project is even part of his business plan. The idea is about “finding ways to get Clintonville residents excited about utilizing different forms of transportation in our community instead of always having to get in our car and drive a half mile away to get to something,” Robinson said. Jeff Ortega, assistant director for the City of Columbus department of public service told 10TV the project is unique in that it has been neighborhood-driven. “We’re hoping that other neighborhoods, similar neighborhoods of like minds will see this and want to work with the city on other projects like this,” Ortega said. This phase of the project is expected to be complete by mid-November. Learn more about biking through Clintonville by clicking here. Johnny Velo Bikes interview is now live on the Joy Venture Podcast !